Keeping a good distance between you and the car in front of you is the safest way to avoid a rear-end collision. When you are following a vehicle too closely on the road, you are tailgating. 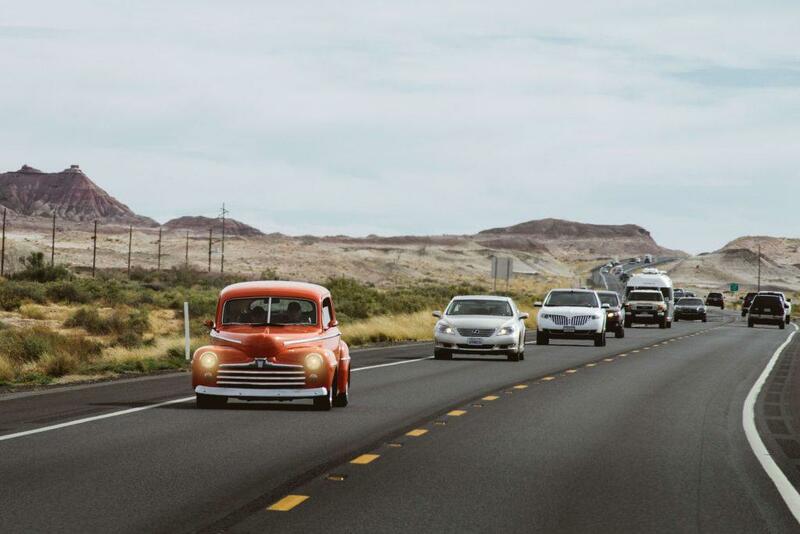 Tailgating is considered an aggressive driving behavior that can be mistaken for road rage. To avoid tailgating, use the 3-second rule. What is the 3-Second Rule? Driving instructors teach new drivers to use the "3-second rule." The three second rule helps you avoid accidents. When driving, pick a non-moving object along the road, like a speed limit sign, a tree, or a telephone pole, and when the vehicle in front of you passes that object, start counting in your head. 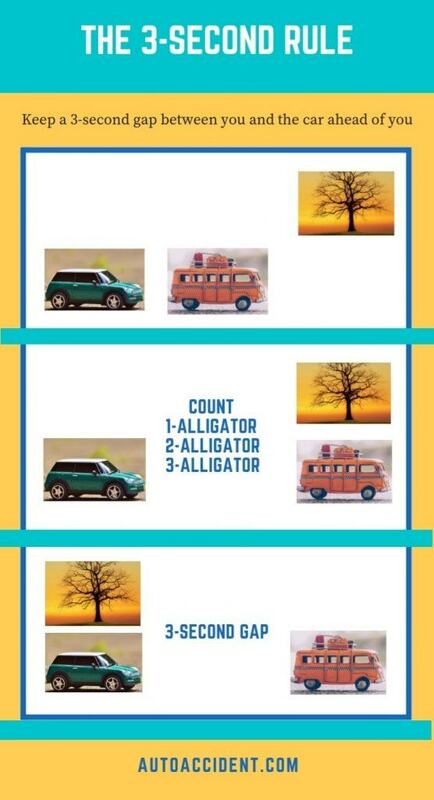 Count slowly "one-alligator, two-alligator, three-alligator" and note when your vehicle passes that object. You want to be able to count to three in the time it takes your car to reach the object, as that would mean you have enough time to stop your vehicle if the car in front of you came to a sudden stop. This is a flexible standard, and this makes it helpful in many situations, like when traveling very fast on the highway, or going more slowly down city streets. The 3-second rule only applies to good, daylight driving conditions. 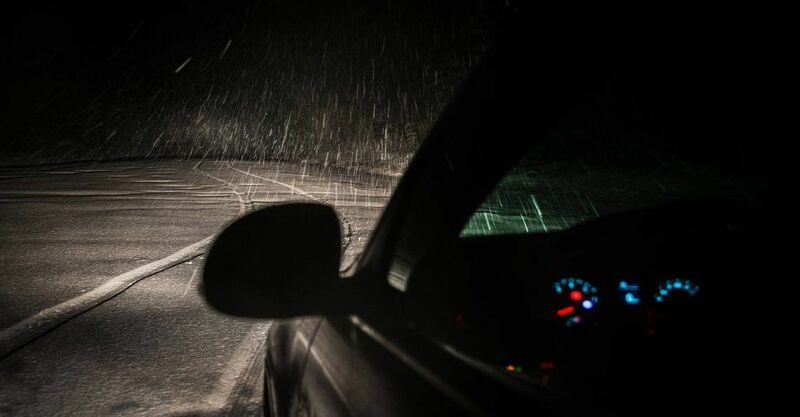 If you are driving in heavy traffic, driving at night or in weather conditions that are not ideal, such as rain or fog, consider doubling the 3-second rule to six seconds as a safety precaution. If the weather conditions are very poor, like heavy rain or heavy fog, try tripling it to nine seconds to maintain a safe driving distance. When you are stopped at a red light, you don't need to leave a full car length between you and the vehicle in front of you, but a good "rule of thumb" is to have enough space that you can see the back wheels of the car in front of you on the pavement. Every driver must be aware of his or her surroundings and make enough space for reaction time in case something goes wrong up ahead. Watch YouTube Video: NRSF Tailgating and the 3-Second Rule. This animated video by National Road Safety teaches the 3-second rule for driving. I’m Ed Smith, a Sacramento Personal Injury Lawyer. Maintaining a safe following distance from the vehicle ahead of you is a good way to avoid an accident. If you or a loved one has sustained injuries in a car accident, call me at (916) 921-6400 or (800) 404-5400 for free, friendly legal advice. For a listing of our past cases and how they were resolved, go to our verdicts or settlements page. Our past client reviews are on Yelp, Avvo, & Google.